Thank you for your interest in our living memorial program. The AMVETS Memorial Carillon program that is a truly unique an ongoing living memorial to our Nation’s deceased veterans. The history of the program dates back to 1948 when AMVETS sought an appropriate memorial to honor those who had given their lives in World War II. After studying the tributes presented by other organizations and groups memorializing the dead of other wars, AMVETS decided that a “living” memorial, a carillon whose bells, symbolic of Thomas Jefferson’s historic words, “eternal vigilance is the price of liberty”, tolling as a constant reminder would be the most appropriate. A carillon would not only affirm that the sacrifices made by those who died were not in vain, but would also serve to remind us of our legacy and of our debt to those who fought to preserve freedom throughout the world. The first carillon was installed at Arlington National Cemetery in Virginia. Accepted by an Act of Congress in October 1949, this carillon was dedicated by President Harry S. Truman on December 21, 1949 with his now immortal words, “…As these bells ring …honored dead rest … freedom lives…”. This particular carillon was so well received that AMVETS established a continuing carillon program. In addition to Arlington National Cemetery, AMVETS’ carillons are located at 92 locations and still increasing. A replacement carillon was dedicated at the Harry S. Truman Library in Independence, Missouri on December 21, 1984 exactly thirty-five years after President Truman dedicated the first AMVETS Carillon. This dedication marked the very last event that honored President Truman during the 100th Anniversary of his birth. Other carillons are located at the memorial erected in tribute to the memory of the 1,177 crewmen of the USS Arizona at Pearl Harbor, Hawaii; the Hoover Library in West Branch, Iowa; the John Fitzgerald Kennedy Library in Boston, Massachusetts; the Eisenhower Library in Abilene, Kansas; the State Capitol building in Salt Lake City, Utah; Freedoms Foundation at Valley Forge, Pennsylvania and at AMVETS National Headquarters in Lanham, Maryland. Additional AMVETS carillons are located at Phoenix, Arizona; Sierra Vista, Arizona; Fort Smith, Arkansas; Gustine, California; Igo, California; Riverside, California; Bay Pines, Florida; Bushnell, Florida; Jacksonville, Florida; Decatur, Georgia; Honolulu, Hawaii; Camp Butler, Illinois; Chicago, Illinois; Danville, Illinois; Peoria, Illinois; Quincy, Illinois; Rock Island, Illinois; Wheaton, Illinois; Marion, Indiana; Madison, Indiana; West Lafayette, Indiana; Waterloo, Iowa; Leavenworth, Kansas; Greenup County, Kentucky; Hopkinsville, Kentucky; Radcliff, Kentucky; Williamstown, Kentucky; Chalmette, Louisiana; Jackson, Louisiana; Keithville, Louisiana; Caribou, Maine; Crownsville, Maryland; Flintstone, Maryland; Agawam, Massachusetts; Bourne, Massachusetts; Chelsea, Massachusetts; Augusta, Michigan; Grand Rapids, Michigan; Holly, Michigan; Marquette, Michigan; Jefferson Barracks, Missouri; Springfield, Missouri; Lyndhurst, New Jersey; Buffalo, New York (2); Calverton, New York; Montrose, New York; Northport, New York; Schuylerville, New York; Stony Brook, New York; Asheville, North Carolina; Durham, North Carolina; Fayetteville, North Carolina; Salisbury, North Carolina (2); Dayton, Ohio; Georgetown, Ohio; Rittman, Ohio; Sandusky, Ohio; Fort Gibson, Oklahoma; Eagle Point, Oregon; Indiantown Gap, Pennsylvania; Florence, South Carolina; Abilene, Texas; Corpus Christi, Texas; Dallas, Texas; Houston, Texas; Killeen, Texas; Mission, Texas; Quantico, Virginia; Milwaukee, Wisconsin; Spooner, Wisconsin; Union Grove, Wisconsin. AMVETS and The Robert R. McCormick Foundation have installed and dedicated carillons in Europe and North Africa as follows: Normandy American Cemetery, Colleville-sur Mer, France; Epinal American Cemetery, Epinal, France; Manila American Cemetery, Republic of the Philippines; Netherlands American Cemetery, Margraten, The Netherlands; Somme American Cemetery, Bony, France; Meuse-Argonne American Cemetery, Romagne-sous-Montfaucon, France; North Africa American Cemetery, Carthage, Tunisia; Oise-Aisne American Cemetery, Seringes-et-Nesles, France; Cambridge American Cemetery, Cambridge, England; Brookwood American Cemetery, Surrey, England; Aisne-Marne American Cemetery, Belleau, France; Florence American Cemetery, Florence, Italy; Henri-Chapelle American Cemetery, Hombourg, Belgium; Brittany American Cemetery, St. James, France; Lorraine American Cemetery, St. Avold, France; Saint Mihiel American Cemetery, Thiaucourt, France; Ardennes American Cemetery, Neuville-en-Condroz, Belgium; Flanders Field American Cemetery, Waregem, Belgium; Nettuno, Italy and Suresnes American Cemetery, Suresnes, France. The carillon located at AMVETS National Headquarters was designated as the AMVETS National Memorial Carillon on July 4, 1976, in commemoration of our Nation’s 200th Anniversary. 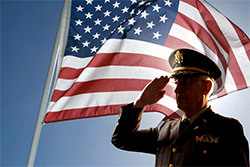 AMVETS invites its supporters and members to enroll the name of an immediate relative, who is now deceased and who served with honor in the United States Armed Forces, in the National Memorial Roster, in order that the bells of the National Memorial Carillon could toll in tribute to his or her memory on a specific date and time requested. The National Memorial Roster is on display in the Chapel at AMVETS National Headquarters, 4647 Forbes Boulevard, Lanham, Maryland 20706. The AMVETS Memorial Carillon program further provides for the future installation of carillons. For example, AMVETS’ goal is to install carillons at all of the Department of Veterans Affairs regional and national cemeteries throughout the Nation.